Description and Definition of Blowguns (Blow guns): Blowguns or Blow guns one of the most ancient Native American weapons and was used by the Cherokee and many other Native Indian tribes. A blowgun (also called a blow gun, blowpipe or blow tube) is a simple weapon consisting of a hollow tube made of cane or reed for firing light projectiles, arrows or darts. The projectile is propelled by the force of the breath. Blowguns were ancient, primitive weapons used by Natives Americans that required minimal resources or technology to construct. Aiming different types of projectiles using Blowguns (Blow guns) demanded little equipment and not much practice to be effective. The Cherokee and other tribes of Native Americans used Blowguns but as they were made of perishable materials, few ancient Blowguns have survived and are rarely depicted in the paintings of the period. Blowguns (Blow guns) were used primarily as piercing weapons for hunting purposes but also for warfare. Uses of Blowguns (Blow guns) for Hunting: The projectiles were used to bring down small game such as squirrels and also birds. 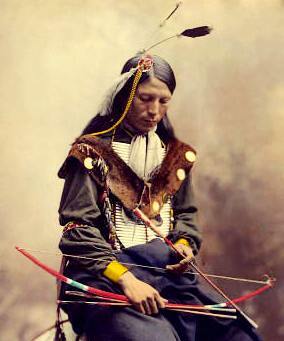 During warfare the darts or arrows of blowguns were often poisoned. The poison was stored in special cone shaped clay receptacles that were kept in the bottom of the blowgun quivers. The poison was obtained from either poisonous snakes, or even gila monsters, and from extracts from various plants. To obtain venom from a rattlesnake the reptile was irritated until it repeatedly struck into the liver of an animal, impregnating it with its virus. Alternatively poisonous snakes were induced to bite into a piece of spoiled meat or liver. The blowgun arrows or darts were then dipped into the poisoned meat. Extracts from plants were also used to obtain poison for arrows. Many tribes used used extracts of yew from bark and needles as arrow and spear poisons. Some other plant juices were also used for poisons for blowguns. Refer to Poisoned Arrow. The canes used to make blow guns were from Arundinaria, commonly known as the canes, which is the only type of bamboo native to eastern North America. The canes are characterized by their woody, cylindrical stems and grow in areas with hot, humid summers, where the canes reach heights of up to 50 feet and over two inches in diameter. The Arundinaria or the canes plant was extremely important to the Southeastern Native American tribes who used the cane used to make everything from houses and weapons to jewelry and medicines. It was also used extensively as a fuel. The bamboo canes could be used to make other weapons besides blowguns such as simple spears by sharpening one of the ends and the flexible wood was sometimes used to make bows.